Family friendly budget accommodation overlooking the waterfront, shoreline, beautiful marina, boats and near cafes, restaurants and promenade. All the family will enjoy spectacular sea, coast, boat and water sport views (see photos). It offers quality furnishings and features like the huge 5ft double glazed windows to maximize the lovely sea and boating views. The ever changing sea and boating activities seen from nearly every room are simply spectacular in any weather or season. Relax whilst watching the water skiers or enjoy a meal in the dining room whilst watching the boats return to the marina with the day's catch. A contemporary hand made leather corner suite and chair complement the sitting room along with mango wood furniture for you to enjoy whilst watching either the freeview package channels or a DVD on the large LCD TV. With a spacious dining room and large table easily able to accommodate six people, any meal will be a treat whilst taking in those sea and boating views. With an airing cupboard, fitted wardrobes in every bedroom (walk in for twin bedroom) storage for all your belongings will not be an issue. There is plenty of safe parking available and Marina Reach has its own secluded private access via 2 flights of metal steps leading to the decked sun terrace and property entrance. The terrace is south facing and enjoys sun all day when it’s out. There is an excellent co-op supermarket just 2 minutes walk away which does everything from papers, fresh bread, food, drink to DVD hire, it also has a post office and cash machine inside. What more could you want! Fancy an evening meal/drink overlooking all the yachts and boats or a cream tea/snack whilst watching them depart and return, then the marina restaurant, cafe and shop is only minutes walk away. Check in time is between 3pm and 10pm on your day of arrival. We regret that we can not allow arrivals after 10pm as we have to be considerate to other appartment residence within the complex. Thank you. Please see reviews on TripAdvisor. Nice large family bathroom with a modern white suite which also benefits from a shower. Guests are required to bring bedding for requested Z beds. Clothes Horse provided to dry indoors or out. 2 Flights of outside metal steps to private sun terrace and private entrance to Penthouse. Each flight has the same amount of steps as a typical house. Hand rails both sides and wide enough for 2 to go abreast if assistance is needed. Resting place between the 2 flights. Steps exclusively for Marina Reach. Thank you for leaving this lovely review. We’ve just returned back to Advertising with Homeaway after a number of years and we’re thrilled you had such a nice stay and enjoyed the property as much as you stated. We look forward to your return visit. We had a great stay in this lovely spacious apartment. It was clean and tidy with everything you'd need for a relaxing holiday including really comfortable beds for a good nights sleep. The views from the large windows are outstanding. I didnt think we'd find something like this so reasonably priced. What more could you want! With some of the highest sunshine records in Britain held in West Wales, what better way to spend the day than on some of Pembrokeshires award winning beaches. Pembrokeshire has more blue flag beaches than any other county in Britain and with over 180 miles of coastline (Britains only coastal national park) there are sandy beaches, walks and sights to suit everyone at all times of the year. There is truly something for everyone to enjoy from the many tourist attractions like Oakwood Leisure Park, Folly Farm and Heatherton to name but a few, to numerous boat trips where you can see whales, sharks, dolphins, seals and puffins around the small islands dotted around the coast. 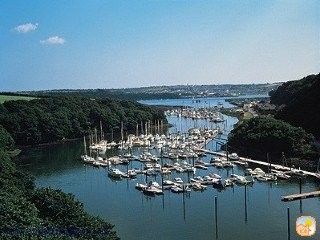 Situated on the beautiful calm waterway with its impressive marina, waterfront and major sailing and water sports centre. It also has a fine promenade and picnic area with superb views over the water. Lovely areas for walking with the family, fishing or crab lining off the quay wall or slip ways. Check in time is between 3pm and 11pm on your day of arrival. We regret that we can not allow arrivals after 11pm as we have to be considerate to other appartment residence within the complex. Thank you.